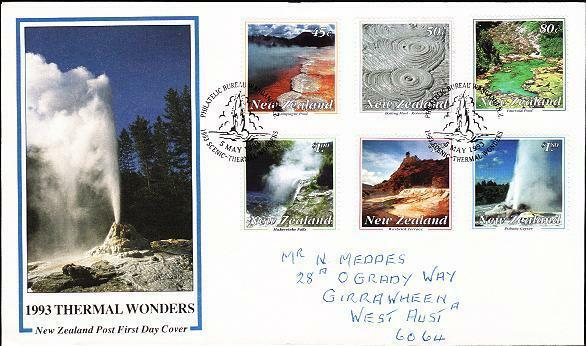 Virtual New Zealand Stamps: 1991 - 1993 Scenic Stamps. For hundreds of millions of years the enormous pressure created by the movement of the continental plates has been shaping and changing New Zealand's landscape, creating spectacular indicators of the turmoil beneath the earth's crust. These astonishing rock formations were the subject of the 1991 'Scenic Wonders' issue. 40c - Punakaiki Rocks. 60c - Moeraki Boulders. Layers and layers of limestone pancakes - the Punakaiki Rocks, also known as 'Pancake Rocks', are situated at Dolomite Point, 48kms north of Greymouth on the West Coast of the South Island. The solid pillars, consisting of alternating layers of limestone and softer rock were formed about 50 million years ago. Since then, the unrelenting assault of the Tasman Sea has eroded away all the layers of soft rock, leaving the harder layers of limestone projecting. The resulting rock formations look like giant stacks of pancakes. Visitors to Punakaiki find themselves witnessing dramatic sights and sounds as the waves rolling in to the coast crash through chambers and erupt through blowholes which have been carved by the sea. These 'special effects' are particularly striking in a westerly wind. Maori legend provides an explanation for the origin of the mysterious Moeraki Boulders on Koekohe Beach in North Otago. It tells of the loss of the Arai-te-uru, a legendary sailing canoe from the island of Hawaiki. Travelling south in search of precious greenstone, Arai-te-uru capsized near Shag Point reef and her crew was lost. The canoe's petrified hull became the reef and a nearby rock is the body of Arai-te-uru's commander. Eel baskets, calabashes and kumara washed ashore from the wreck and were transformed into the giant Moeraki Boulders. 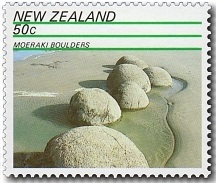 However, the scientific explanation for the origin of the Moeraki Boulders is simply that they have been weathered out of the siltstone from the sea cliff. 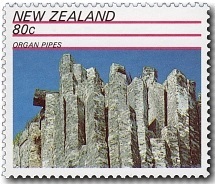 80c - Organ Pipes. 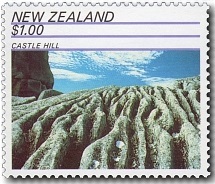 $1.00 - Castle Hill. Monolithic organ pipes straining heavenward - The Organ Pipes are situated on the slopes of Mount Holmes, in the volcanic hills which surround Dunedin. These incredible columns of rock were formed about 10 million years ago when lava flowed across the summit of Mount Holmes, hardening and exerting tension in both vertical and horizontal directions. The tension was relieved by cracking which formed the distinctive shapes of the organ pipes. Geologists explain that the lava cooled at different rates in different places, creating the varying diameters and heights of the pipes. Carved by the onslaught of the elements - Castle Hill rises almost 1000 metres above the surrounding countryside, a distinctive landmark on the harsh, rocky landscape of central Canterbury. Castle Hill's dramatic contours were formed by complex folding of the earth's outer crust (or Tertiary strata) as a result of the movement beneath it. Prevailing winds and driving rainwater have weathered the limestone and scoured deep grooves out of the hillside. 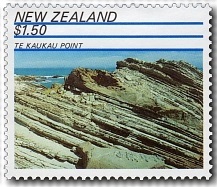 $1.50 - Te Kaukau Point. 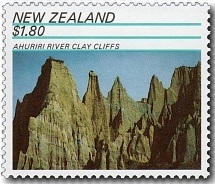 $1.80 - Ahuriri River Clay Cliffs. 45 degrees South - In extreme contrast to the rolling pastures of inland Wairarapa, the southeast coastline of the district is harsh and rugged. One of the most dramatic formations is Te Kaukau Point, located at the mouth of the Opouawe River. The heavily scarred and layered cliffs have been forced into their present 45 degree angle by enormous geological upheaval. From its highest point the formation drops abruptly for 90 metres to a broad ledge near sea level. Jagged clay pinnacles honed by water erosion - On the main road to Lindis Pass, about 10 kilometres south of Omarama in the Mackenzie Basin, are the Ahuriri River Clay Cliffs. The extraordinary cliffs were formed from glacier gravel and river silt deposits which were later forced 100m upward by an earthquake fault. Their elegant pinnacles are gradually reformed each time the Ahuriri River floods and the water runs down the cliff face in narrow streams. As the pinnacles to the front are eroded away, the cliff behind them weathers to form new pinnacles. In this way the Ahuriri River Clay Cliffs are slowly but surely retreating westward. 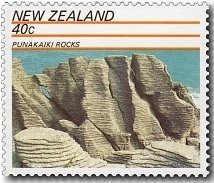 1991 Scenic Issue - Rock Formations FDC. The awesome activity of the huge glaciers of the Pleistocene ice ages has shaped much of the face of New Zealand's South Island over the past two million years. Since that era ended around 14,000 years ago, glaciers have fluctuated at near their present sizes. The 3,150 inventoried glaciers in New Zealand range from many at one hectare in size to the majestic Tasman Glacier which is 9,634 hectares in area and 28.5 kilometres in length. Glaciers are formed high up in the mountains where the summer melt is unable to remove all of the winter snow. A surplus of snow accumulates each year, and it is this snow which feeds the glaciers. The snow is transformed into ice and flows slowly down the mountain into the warmer temperatures of lower altitudes where it melts away. Like the hour hand of a clock, the movement of the ice down the mountain is too slow to be seen. But it can move between several centimetres a day to several metres a day in fast flowing, steep glacier trunks. Debris falling from the mountainside is carried on and within the glacier and further debris is collected at the glacier base by the moving ice. The debris forms an abrasive layer which gradually wears and gouges the bedrock into smooth, glaciated forms. Glaciers behave as huge but very sensitive climate indicators. While the glacier ice continually flows downwards, the position of the glacier front in the valley changes with the altering climate. In cooler, snowy climates the glacier front advances down the valley and when the climate is warm and dry the glacier front retreats. 45c - Glacier Ice. 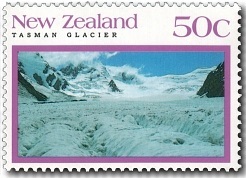 50c - Tasman Glacier. Ice of the Franz Josef Glacier fractures as it moves over its steep rough bed, forming these spectacular frozen pinnacles called 'seracs'. Melting of the ice has revealed internal ice structures which were formed deep within the glacier. The Tasman Glacier, in the Mount Cook National Park, is the largest glacier in New Zealand. Measuring a mammoth 28.5 kilometres long, the Tasman is extensive even by world standards. Numerous basins of accumulated snow feed a single trunk of unusually thick ice which is hundreds of metres deep. In December 1991 a massive rock avalanche crashed 2720m from the summit of Mount Cook on to the glacier below, adding to the massive load of rubble carried by this glacier. 80c - Snowball Glacier. 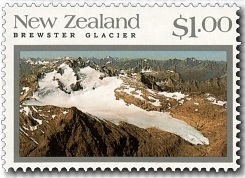 $1.00 - Brewster Glacier. 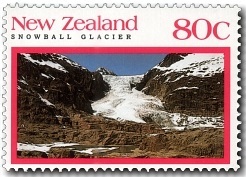 The Snowball Glacier is a collective name for a group of glaciers. The glacier shown on the 80c stamp is one of two glaciers tongues which drain a large ice field named the Marion Plateau. Because of the low relief of the surrounding ridges there is very little rock debris and the glacier cuts a striking path of clean ice through smoothed bedrock. The Brewster Glacier, situated on Mount Brewster, is 2.75 kilometres long with a gentle gradient and crevasse-free surface. It is one of the few glaciers situated near a State Highway but it is seldom noticed by travellers. Only the tip of the glacier's snout is visible form the road at the brink of a precipice high above Haast Pass. 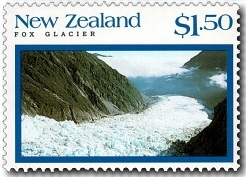 $1.50 - Fox Glacier. 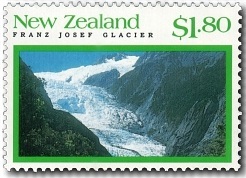 $1.80 - Franz Josef Glacier. A broad, high block of land provides plenty of snow accumulation areas to feed New Zealand's famed Fox and Franz Josef Glaciers. The glaciers are very similar in both shape and size and are renowned for the low altitudes to which the ice descends within the forest zone. Huge volumes of ice spill through steep, narrow valleys well below the upper forest limits. The spectacular terrain coupled with the low altitude of the glacier fronts makes for magnificent views. Both the glaciers can be reached after just a short walk. Some years ago we took helicopter flight over and a guided walk up on to this glacier. It was amazing to see so much ice twisted and broken. We viewed large cracks going down deep into the ice where water could be heard running far below and we explored some tunnels going right through larger ridges too. What really got my attention was being told this was a river of ice under our feet, continually moving, creeping down the valley. 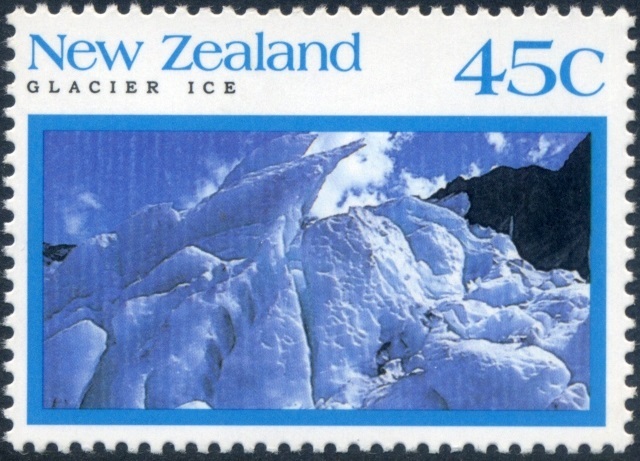 45c Glacier 1992 45c, blue ice has vertical white lines running through. While this looks like it could be a drag mark the error is confined to the design image. This is caused during the lithography printing process where the printer hasn't achieved the correct balance between ink and water across the printing plate. 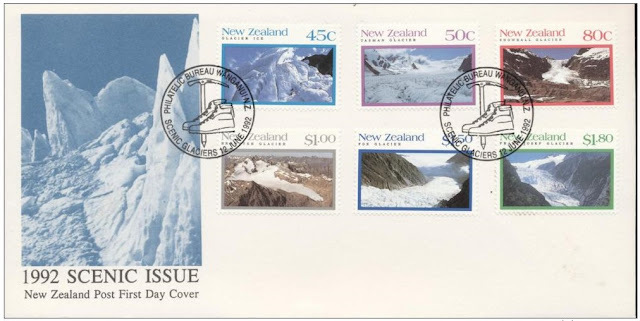 1992 Scenic Issue - Glaciers FDC. It is hard to visualise two million cubic metres of molten rock and ash erupting and causing a lake to be completely obliterated. Moreover, steaming craters stretching some 16 kilometres appearing where the lake, Lake Rotomahana, had been - the legacy of the 10 June 1886 Mt Tarawera eruption. The awesome strength of natural forces unleashed in a manner difficult to imagine, let alone understand. But there, in one night, more than 100 people were killed and the destruction of natural features, already famous beyond our shores was of a scale unprecedented in this young country. A scar of such magnitude cannot heal overnight and the evidence can still be seen and wondered at to this day. The Pink and White Terraces, fortunately captured by the artists of the time as one of the natural glories of the world, were lost overnight. The brilliance of their fan-shaped staircases formed over unknown centuries, the spectacular colour captured in silica, all gone in hours. But all was not lost and Rotorua still attracts visitors from the four corners of the globe anxious to see for themselves these places of bubbling hot springs, boiling mud, erupting geysers, steaming pools and rocks, and eerily cratered volcanic landscapes, the natural thermal wonders of the Rotorua region, Taupo and Tongariro National Park. After the first non-Maori to see Rotorua - a Danish trader, Philip Tapsell - in 1830 it was not until the 1870s that white settlers began to arrive in any numbers due to tribal warfare between the Arawa and Waikato Maori and later the Land Wars which made it unsafe. They encountered thermal activity for the first time in their lives and were both astonished and delighted with what they saw. Word of the wonders spread as to the reputation of the hot mineral-laden pools as places to cure all manner of ills, both real and imagined. Tourists from the other end of the earth made their way to New Zealand to experience the healing capabilities of the spas. The pre-European Maori had their own stories as how this many thermal wonders came about. 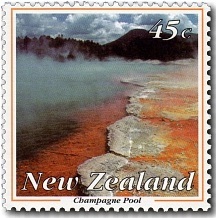 45c - Champagne Pool. 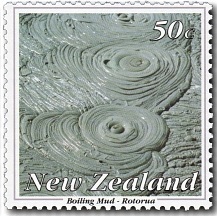 50c - Boiling Mud, Rotorua. Aptly named, this 2000 square metre pool constantly fizzes with a myriad of tiny carbon dioxide bubbles - like a huge glass of champagne. With stunning colour formations, the Champagne Pool and other colourful thermal wonders known as Primrose Terrace, or the Artist's Palette can be discovered at the Waiotapu Thermal Reserve just south of Rotorua. The temperature in the pool varies between 70 and 75 degrees Celsius and bubbles when sand is thrown into it. There is something fascinating, almost hypnotic about boiling mud pools. They are created by subterranean steam rising and altering the composition of surface rock turning it into grey clay and boiling mud. Hell's Gate at Tikitere, north of Rotorua provides some of the most impressive 'porridgy plopping' mud activity. Some graphite pools are hotter than boiling water. This occurs because suspended graphite in these pools is heated by steam to temperatures of 115 degrees Celsius or higher. 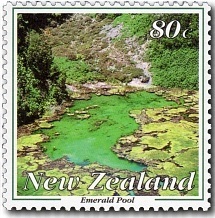 80c - Emerald Pool. 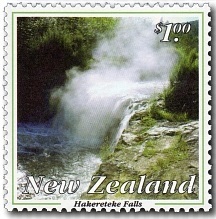 $1.00 - Hakereteke Falls. The 1886 Mount Tarawera eruption produced a number of craters in the Waimangu Valley, some of which remain active. One that is not active, the Southern Crater, has a beautiful small cold water pool on its floor. The Emerald Pool with its brilliant greens and blues, courtesy of high concentrations of pumice, obsidian and silica, give this small hot pool its name. One of the lesser known attractions of the Rotorua-Taupo thermal region, it is nonetheless one of the most beautiful, and easily accessible through the Waimangu Thermal Valley. Less well known than some of Rotorua's attractions, these delightful thermal falls are situated on Hakereteke Stream which is also known as Kerosene Creek, not far from the Waiotapu Thermal Area. It is one of the few waterfalls in the Rotorua-Taupo thermal area which spills warm water. As a result, below the falls is a very warm pool popular with bathers. While the pool is excellent for quiet soaking, the presence of Amoeba meningitis makes it unsafe for diving or any other activity that allows water into the nasal cavity. $1.50 - Warbrick Terrace. 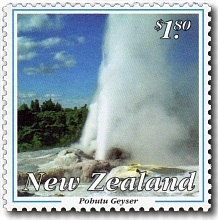 $1.80 - Pohutu Geyser. 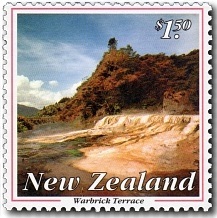 Named after a noted guide of the region, Alf Warbrick, the terrace can be found about 1.5 kilometres from Lake Rotomahana in Waimangu Valley. Hot springs flow over the terrace depositing glistening silica as the water cools. Streaked with many colours, caused by minerals and algae, the terrace is predominantly white. One of the best examples of geyser activity, Whakarewarewa's Pohutu Geyser sends a jet of water 18-40 metres high during its many irregular eruptions. One explanation for geysers is that they erupt when an underground column of water is heated beyond boiling point and bursts into steam, violently ejecting the water contained above the 'flash' point. But variations in atmospheric pressure also play a part - the gases bubble and overflow when the pressure is low, or reduced suddenly, similar to when the cork is pulled in a champagne bottle. 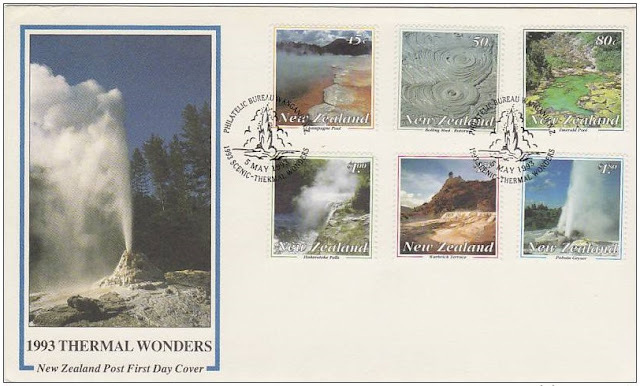 Official 1993 Thermal Wonders FDC. that has actually been sent through the mail system. 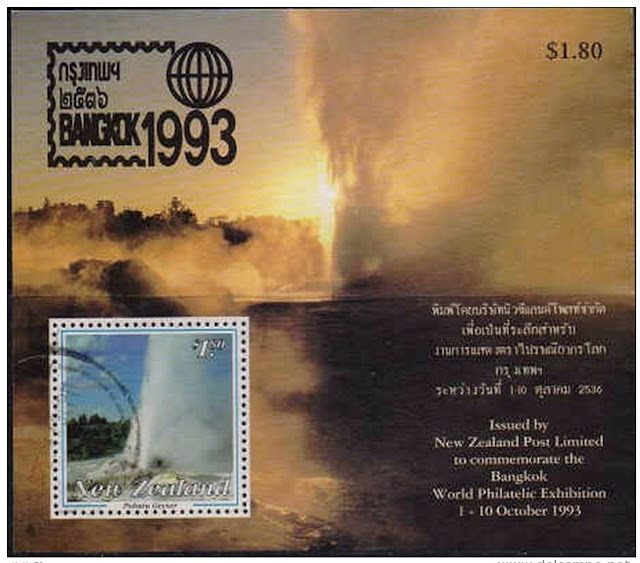 Bangkok World Philatelic Exhibition 1 - 10 October 1993. Technical information - 1991 Scenic Rock Formations. Technical information:- 1993 Scenic Thermal Wonders.